If only eating was a sporting event, then we could have commentitors. Okay this is my first story of a fat furry theme, and it comes with some illustrations. The pictures are in the galley (I hope) and I have put picture marker in the text to show where the story they would be. This is PG or PG-13 rating. 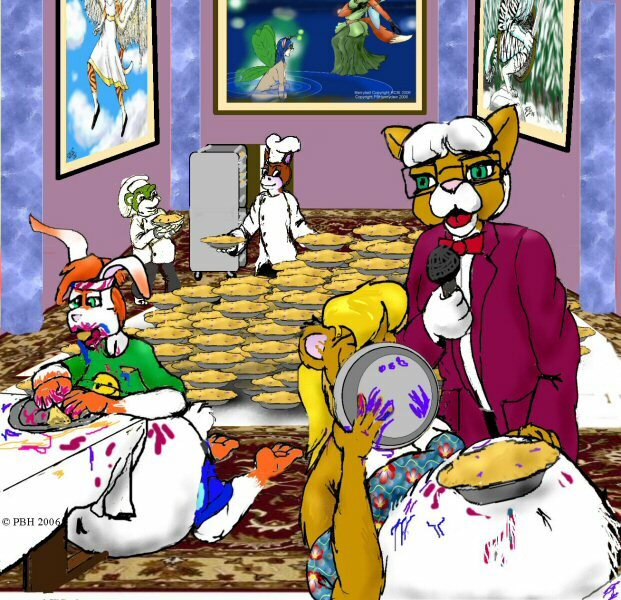 Welcome Glutton fans to Arlene’s Hot Springs Resort’s First Annual’s Pie Eating Contest. Oh, this is not a test for the thin minded or your general over-eater. Each contestant must eat 60 pies to make it to the final rounds, and these are not your average pies either but the 12 inch large pies. Each contestant can plan which of the 6 different favors of pies they will eat first. But all must be eat the same favors and amount sooner or later. Remember, there is not time limit this round but you can’t rest longer than 5 minutes between pies or have more than 3 rest periods. Standard rules on barfing still apply. The rules for the final rounds will be explained if we do not have a winner. Honey Woodson plays the Daisy Duke as all you, Dukes of Grazard fans know. Miss Honey weight in at scrawny 130 pounds at height 5’ 9” Golden brown bear. Miss Honey Woodson said that despite her TV career, she has been feeling an emptiness in her life. She says that she has turned back to her family and religious beliefs. She is planning on a long retreat this winter to help find her spirital center and renew herself.. This contest, she says, will be the first step for her long winter’s meditations and spirital journey. . Don’t worry, folks, she promises that she will be ready for next season in the spring, just with a few extra curves. Daniel Hopp is the hot dog champion, who downed a recorded 57 hot dogs in 12 minutes this past summer. This white and orange rabbit weights at a little under 125 pounds on his short stature of only 5 ft 5 inches tall. But don’t let his small size fool you, Daniel Hopp has been the hot dog champion for four years running. He has beating his own record every year. Danny has want to expand beyond hot dogs and has been training for this event since August. This is his first contest beyond the Baseball Frank Competitions. He is the most favored to win at this event. This grey packing rhino is Iron Mike, who weights in at nearly 280 pounds at 5 ‘8”. Mike Irons, the Bar-B-Q champion, just finished over at the Chili-bowl eat-off. Yet, Mike says that he does have the capacity for this event even after the chili-bowl event under his belt. Mike is an all around eating champion and has won BBQ chicken to bake bean contests, yet he has not won a hot dog contest since Daniel Hopp came on the eater circuit four years ago.. He is pitching for a good fight here, today. And of course, this elegant lady flamingo is Olla Overland, who is owner of Olla’s Pie and Cakes co-sponsor of this year contest. Olla Overland weights in at 250 pounds at 6’ 8”. Olla Overland says that she just likes pies and wants to share them with people who truely enjoy them. It seems to me, that the old girl just wants to eat her own pies without feeling guilty about it. And, we, also, want to welcome all our other contestants and wish everyone gut-busting good luck, and good eating. Now, ladies and gentle furs dig into your pies. As they get started, I will tell you about the Chili-Bowl Eat-Off, which was just held here. Now, it was just bad luck for Mike. An amature bassethound managed to dump a whole 30 gallon pot of red-hot Abby Chili down his own throat in under a minute and keep it all down. That greed dog should have drowned, when he try to serve himself from the pot, slipped and spilled the whole pot down his own face. Yet, when he managed to keep it all that down for 10 minutes, he was declare the winner, before he ran to the restroom. His wife expected the trophy for him since still stuck in the toilet, and she said she was really going to give it to him. Whoa, who would have thought the old girl could run that fast on a full stomach. Yet, what focus, Miss Honey and Daniel have, they continue to stuff themselves during this whole disaster. The count is now, Danny 45 and Miss Honey 40. We have only 4 semi-finalist, who made the 60 pies cut. Miss Honey has eaten her 60th pie and impatiently awaits the next round, while Daniel struggles to finish his 60th pie. Daniel who showed such promise in the beginning, is now paying a high price for his speedy start. And, he has now just finished his 60th pie and will be allowed a 10 minute break as the judges verify the counts and prepare for the next rounds. The second round is 10 more pies and no resting between pies but you have a choice of favors. Finalists must finish with 5 minutes of the leader’s time. The third round is 20 more pies; no resting, random favors and you must finish your pies within 2 minutes of leader time. The final Round is …Oh, what ……. Oh Mrs Olla has return. She has change the final round’s rules to be just a race for the most pies eaten to win. There, you have it. Eat as much as you can without exploding. Oh what excitement, if these two, Miss Honey and Danny, can push themselves into final round. Well, this Glutton contest was been a battle of wills and wits, as well as bellies.. Daniel’s speed trick had fooled quite a few into eating too fast for their intake tolerance, which forced them to drop out. Yet, Miss Honey’s slow and standy pace is working out better as Danny’s endurance continues to dwindle. The poor boy has been stuggling since the second round. We are now at the 90th pie mark and the end of round three. Danny stuggling slowly to complete his 90th pie. And Miss Honey has just finished licking her 89th pie plate clean, as she reachs for her 90th pie. She has licked clean every one of her plates in the second and third rounds, teasing and intimating Danny with every pie along the way. The kitchen crew is now readying the pie pile for the last round.. 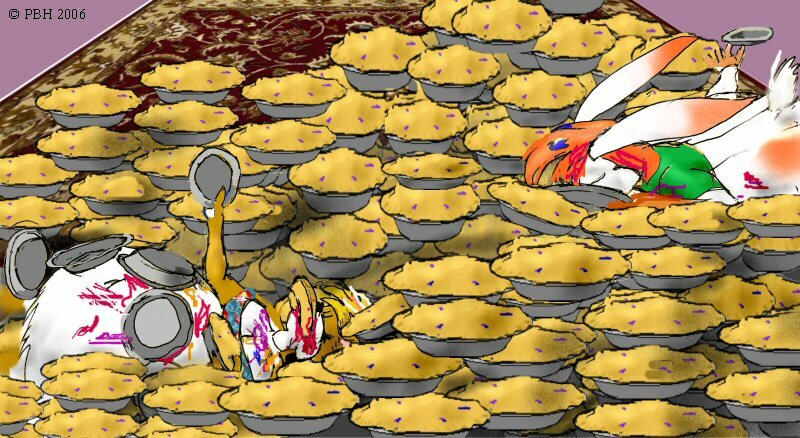 This pile has all the leftover of pies from the other contestants, and at the last count is over 550 pies. Each contestants will be on opposite sides of the pile and will eating their way to the middle. The empty pie plates from each will be removed and counted, but each eater must grab their own pies from the pile. The one with the most empty plates will be the winner. Oh, no but poor Danny does not look like he can’t continue… Oh wait, what sportmanship, Miss Honey is hugging him and give him good pep-talk. Or Maybe, she’s kissing him or is she just licking the pie off his face?..but yes, yes, he is showing signs of life, and they are ready to start the final round. And now, they are off and eating …..Miss Honey is eating at …Can you believe it? …She has managed to increased her pace after 90 pies! And Yes, Daniel seems to have found his second wind, and is back to his jaw-dropping speed of 2 pies per min. It looks like the only thing that will stopping these two will be their immovability to get more pies. Yet, Miss Honey seem to have a plan for that as she digs in and under the pie pile, Oh Oh, she is near the center the pile and is turning over on to her back. The pies are now just falling into her waiting mouth. Danny has a different approach as he eats and forces his way to the top of the pile. His growing belly is pushing his face into the pile as he eat his way down.. Each of them are still throwing empty pies plates out of the pile. The count is now 160-150 pies with Danny in the lead and both are not slowing down..
“Honey Bear, You know I can’t do it any more?” protests over stuff rabbit. Ohohoho Buuuuuuurp burp burp Guuuuurp. Oh Hey folks… Yes,. Yes, they are still at it after 4hours. The rest of the judges and the crowd have left for the Skylight Ballroom and the official counting has stopped at 317 to 325, which a load of crock. So, what if they burped or that them are now, feed each other? I tell ya…What…. What happened you ask? “why, yes please.. I have so much more room, now.” Excite Honey started to eat from Danny’s hands. After that, they traded belches for pies, and took turns feeding each other. The judges call it at 317 to 325 in favor of Miss Honey. And then eneryone left. Says a young bellboy mouse. “It is Okay I understand the dangers and the isolation of the cabin. Just once the snow starts to melt and you can’t reach me by phone. send someone to checkup on us.”, states the golden bear. “I got peach” offers the stuff white rabbit. “Here, you need more Mulberry”,says Honey as she offer him another pie. “TeeHee Sure, Anything for you, my Funny Tummy Bunny… just be sure bring pie” giggles the stuff starlet. As the forklift with sofa takes both Pie-lovers out the back door of the Grand hall.